On April 21, in the Vatche and Tamar Manoukyan Library, His Holiness Karekin II, Supreme Patriarch and Catholicos of All Armenians; received the members of the Democratic Liberal Party, who had arrived in Armenia on the occasion of the second congress of the party. Mr. Hakob Avetikyan, representative of the Democratic Liberal Party, presented the activities of the congress in Yerevan to the Armenian Patriarch, noting that the congress aims to find solutions to overcome the problems in the party and establish final unity. He emphasized the dedication and love of all the members of the Party towards the Homeland, the Mother See of Holy Etchmiadzin and her Patriarch, expressing joy that the spiritual center of all Armenians, due to wise and nation-building activities of His Holiness, constantly strengthens and prospers. Welcoming the visit of the representatives of the Democratic Liberal Party to Holy Etchmiadzin, His Holiness highlighted the party’s historical mission in the lives of all Armenians around the world and their unconditional devotion towards the Armenian Apostolic Holy Church. His Holiness expressed his appreciation to the members of the Democratic Liberal Party that has consistently supported the Mother See of Holy Etchmiadzin in accomplishing her mission. 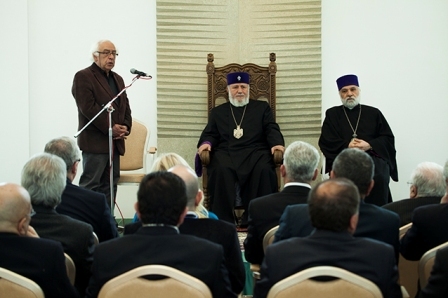 His Holiness reflected also on his visit to Artsakh, with Catholicos of the Great House of Cilicia Aram I, stressing that they witnessed the courage and heroism of the Armenian soldiers and manifestation of the people’s spirit of unity. Catholicos Karekin II wished the Democratic Liberal Party members the same unity, expressing hope that the National Party will find strength to unite and resolve their challenges. Present at the meeting was His Eminence Archbishop Nathan Hovhannisyan, Head of the External Relations and Protocol Department of the Mother See. This entry was posted in Featured News, News and tagged Armenian Patriarch, Democratic Liberal Party, Hakob Avetikyan, His Holiness, Holy Etchmiadzin by Orthodoxy Cognate PAGE. Bookmark the permalink.